← John Vonderlin: These Guys Saw It First…. 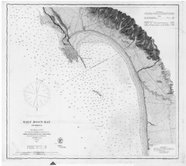 A second feature I found interesting on the Coast Survey Map of Half Moon Bay Harbor from 1863, was Whaleman’s Harbor. 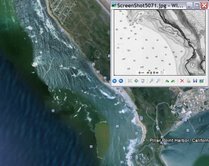 You’ll find it just north of Pillar Point in the middle of the Fitzgerald Marine Reserve. 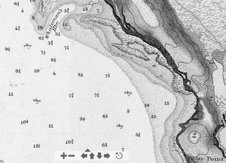 With research I was able to read that the area had been used as an aid to a Shore whaling station in the mid-1800s. Obviously given the map’s date, 1863, it had to have been before that. I’ve overlayed the Survey map over a Google Earth segment to help indicate it’s location. Note the darker water and breaker free area of Whaleman’s Harbor in the Google Earth photo. Apparently, the deeper waters of the “harbor” are caused by the Whaleman’s Harbor Anticline, just south of it. Those deeper waters allowed a boat towing a dead whale to approach close to the coast, from where the whale could be winched to the beach. 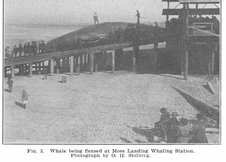 While researching this activity, shore whaling, I came upon an amazing online document from 1923 called ” A History of California Shore Whaling” by Edwin Stark content.cdlib.org/ark:/13030/kt7t1nb2f7 or use its title. “This station was started about 1860 or 1861, and in a couple of years moved to Pigeon Point, after which another company was organized here. Scammon lists it as existing in 1874, and it was abandoned some time in the eighties. The station was situated on the point known as Pillar Point. The station at Halfmoon Bay moved to Pigeon Point about 1862. It was situated on the point near the lighthouse. Captain J. F. Bennett, landing from a whaling voyage, took command and retained it for many years. Goode’s “Fishery Industries” supplies the information that Captain Anderson, upon leaving the Portuguese Bend station, came to Pigeon Point in 1877, but whether he brought his company with him or took over Captain Bennett’s company is not stated. He only stayed two years, and then moved with the entire company to Cojo Viejo, near Point Conception. After this Captain Perry commanded a station here until about 1895 when it was abandoned. Col. A. S. Evans, in “Sketches of the Golden State,” 1873, describes Pigeon Point station, giving the results of the current year and the one before. But, what the document lacks in local details, it makes up for in very detailed descriptions of every facet of this incredibly hazardous occupation. And it has lots of pictures of the stations that ought to shake up any Marine Mammal lover. 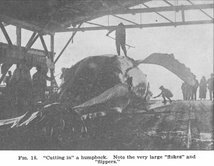 Having actually visited a whaling station on Hudson Bay, near Fort Churchill in 1968, and watched a small whale be dragged by a cable from a bloody cove into a open air shed where it was processed, I can empathize. 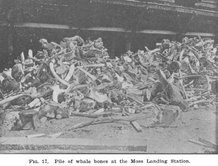 The whale could only be converted into canned pet food because of the unsanitary conditions at the station and the smell, caked gore and huge bins of bloody parts, made that a good thing as far as I was concerned.